Remember when Just Cause 3 came out and it was utterly ridiculous and we all loved it? Well, it’s soon to become even more ridiculous with the release of the Mech Land Assault expansion tomorrow, which puts Transformers-inspired mechs in the hands of players. For more of the great gaming without boundaries, check out the best sandbox games on PC. In celebration, Square Enix have put together a launch trailer showing off the expansion’s destructive gameplay, albeit realised in the style of 90s cartoons like Pokemon and Dragon Ball Z. Why? 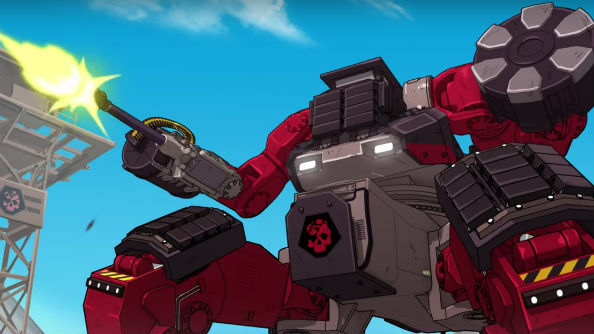 We don’t know, but the trailer features a mech punching a helicopter out of the sky, so there’s that. The expansion itself is out June 10th, and will give gravity-proof protagonist Rico Rodriguez access to two pilotable mechs as he’s tasked with taking down the mysterious Black Hand group. The DLC’s plotline will also take players to the island of Lacrima, which is part research base, part prison camp – we assume it’s 100% combustible. The main draw however, is the mech’s GRIP feature, which appears to behave much like Half-Life 2’s Gravity Gun… you know, except with tanks and guard towers instead of saw blades.